It's important to speak up early and candidly. There's nothing wrong with asking your boss, "If I ever wanted to talk about my salary, how and when could that happen?" Judging their reaction will give you some idea of their openness to the issue. And it puts them on notice that you are seeking to advance your fiscal standing. You should avoid the mistake of waiting until your annual review to ask for a raise - that's probably too late. Budgets for annual raises are set months in advance. Typically your company allocates a certain amount for raises, which your boss must divvy up among the employees. Presenting your case in advance for a greater share will increase your odds of taking a healthy percentage. It also ensures you won't get the standard excuse: "We'll have to take care of you next year." Get noticed! Do something beyond the expected. Find ways to help others accomplish their goals by joining their teams, promoting their strengths, and augmenting their weaknesses. And let your boss know what you are doing. In preparation for promoting your accomplishments, keep careful notes that highlight your value to the organization. Include details on accolades you've received, projects that were successful, and additional tasks you've taken on. Have all the info at your fingertips, accessible for discussions with time-conscious managers. This is crucial for highly motivated employees who routinely assume additional responsibilities as a matter of course. Managers tend to notice low-performing employees because they require constant care and feeding, but productive staffers can easily be overlooked since everything under their purview runs so smoothly. You might be doing a lot and yet your boss barely knows your name. Make promoting yourself a priority. Start by doing some research. What's your company's budget for raises? What's the high, low, and average raise? If you don't know, ask. If you can't find out, use these guidelines. If you're asking for a promotion, 10% is normal. If you're asking for an increase, 3% to 5% is practical. In assessing your true worth, consider your locale as well as your job performance. How well does your position pay for your experience and skill level at the local cost of living? Don't ask for a San Francisco salary if you are working in Des Moines. It won't work. Unless you move to San Francisco. In your salary discussions, lead with questions. If you are excelling at your job, say something like, "I think I'm given a lot of responsibility here, which I really appreciate. And I've accomplished every goal that we've laid out for me to do. I'm curious about whether I'm performing at the level of someone higher up the chain. Can we explore whether I'm being compensated at the appropriate level?" Notice the methodology here. Rather than directly asking for more money, the question is posed to explore where the employee falls in the spectrum of other employees. This allows the evidence to speak for you. Besides, it's always better to ask questions than to tell your boss what to do. What if the answer is no? Rejection is hard to hear, but don't get discouraged. Consider this reply: "What would it take for me to earn the raise in the future?'" If your manager can't tell you, she's likely weak in her people skills, or the company is structured poorly. In either case, it's best to find out now. But if on the other hand your boss does offer a constructive explanation, you'll know how to orient your strategy for the next discussion. Always leave a discussion open to the possibility of a favorable outcome. Interpret a "No" as a temporal condition leading to an eventual "Yes." Accept denial as an opportunity for landing the bigger raise in six months: when you land the major account, when funding in your department is doubled, when you are suddenly promoted. Despite what your friends might tell you, threatening to quit unless you get a bigger paycheck is dangerous territory. While some organizations give cost-of-living raises every year, the vast majority of salary increases are merit-based. The emphasis of your request, therefore, should be on the value of your contribution not the threat of your leaving. It's OK to hint at job retention with, "I love the work I do here and want to stay with the company long-term." But remember that the company can equally reply with, "We love your contribution and we'll sure miss you." 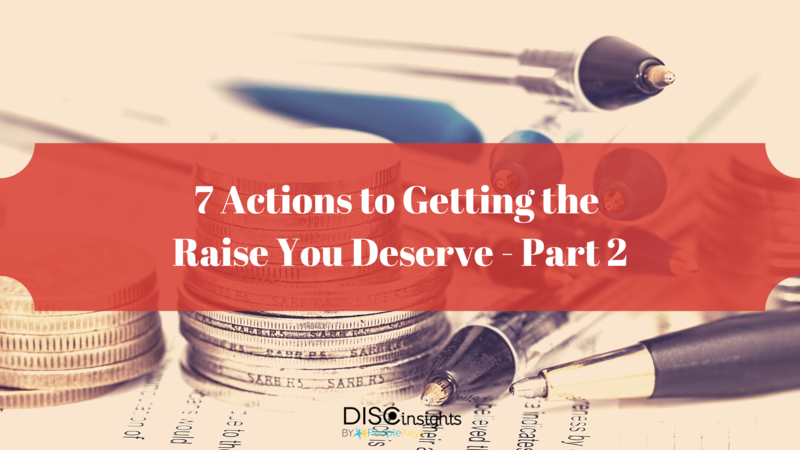 Asking for a raise may currently be in the thought stage, but to win, you have to move to action. Know yourself and try to read your boss and anticipate her strategy. Advancing in the workplace takes research, assertiveness, timing, patience, skill, and determination. You'll get what you want when you're ready to obtain it. Hopefully, now your salary raising plan is clear and already in motion. If you're interested in learning more about the different applications of DISC, you may subscribe to our newsletter. 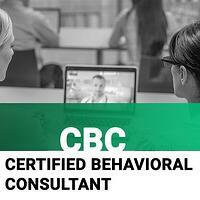 In case you already have a deeper interest in this wide universe of possibilities, consider DISC certification online in our DISC Behavioral Consultant Certification Training.